For your edification and cooking inspiration, here are links to all the finalists for the 2010 James Beard Foundation awards in the book and journalism categories. The entire list of finalists can be found here. Maybe April isn't the cruelest month after all. Here are several things going on next month that you may want to put on your calendar. The latest of our "underground dining" experiments brought us to the newly opened Altamare restaurant in South Beach. Well, sort of new, anyway. 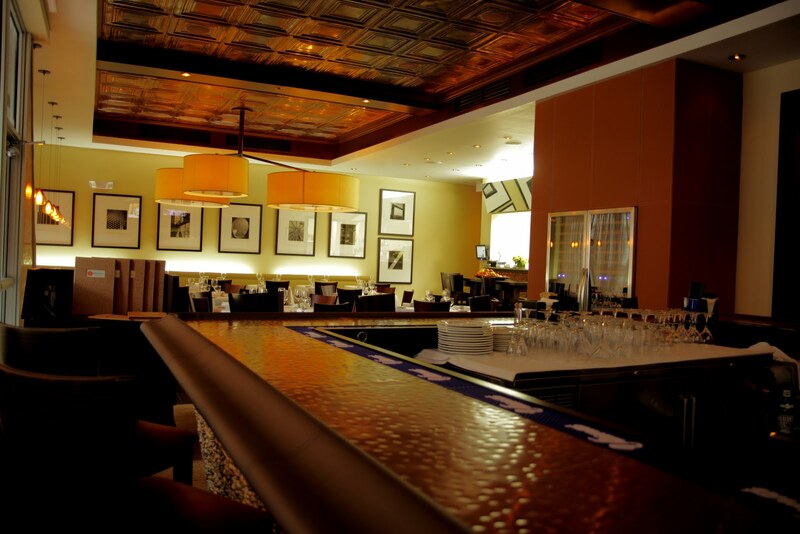 Actually, its predecessor, Altamar, quietly tucked away on the west end of Lincoln Road, was a long-standing locals' favorite for fresh seafood with an Italian bent. Altamar owner Claudio Giordano decided to move a few doors down to a bigger space, buy a vowel, and bring in Chef Simon Stojanovic (a Michael's Genuine Food & Drink alumnus) to take over the kitchen and update the menu. We gave Chef Simon free rein to craft a menu, and Claudio gave the 20 of us a cozy little semi-private corner in the back of the room behind the bar, plus a run of wine pairings to go with the dishes. Unfortunately, I missed nearly half the meal, for reasons that are somewhat embarassing (it was Little Miss F's birthday - the date of which I had overlooked when planning the dinner - and so I joined in late, after B-Day dinner with the family). 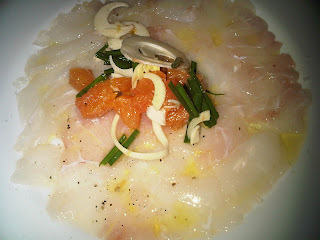 As a result, I didn't get to sample a sheepshead carpaccio, served with cara cara oranges and fresh hearts of palm (for those thinking we've gone overboard, please note: sheepshead here is a fish, not - well - a sheep's head), nor a triggerfish tempura. 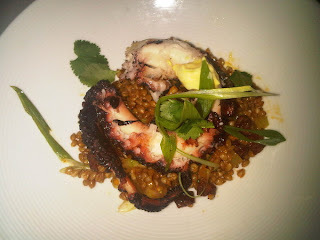 I did get there in time for an octopus dish, the fat tentacles "confited" low and slow and then grilled, served with farro that had been spiked with local green tomato, grilled lemon and chorizo, along with a generous dollop of aioli. It's a great prep method for the octopus, rendering it tender with a nice crusty char on the exterior from the grilling (it's the same method used on the octopus dish that is a menu stalwart at MGF&D). Plus I always support the pairing of seafood and pork products, and the chorizo was just right here, balancing well with the rich chewy texture of the farro and the bright tartnesss of the green tomato and lemon. 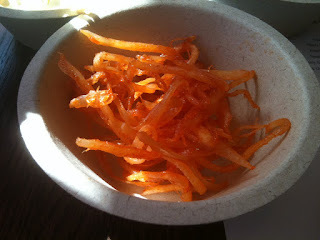 That combination also is one which has made appearances on the MGF&D menu, as a commenter here previously noted. Claudio took an interesting approach on matching a wine to this dish, going with a Cannonau, a red wine (grenache) from Sardinia which I thought worked well with the heartier flavors of the farro and chorizo in particular. 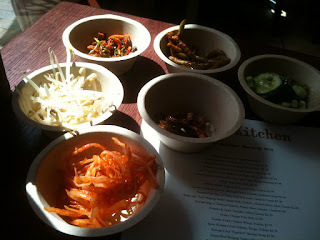 I tend not to retread old ground when writing about restaurants here. When there are so many new places opening up, old places I still haven't gotten around to mentioning, holes in the wall I haven't even discovered yet, it seems a bit goofy to talk about someplace that's already been written up - particularly a place like Red Light, where my initial comments here were already based upon a pretty extensive body of data. But a restaurant is in many ways a sort of organic thing: it can change, it can grow, it can mature, it can get old. Sometimes it's for the better; other times for the worse. I'm immensely gratified that with Red Light, which is approaching its second anniversary, it seems that the changes are all to the good. I didn't realize until I started writing this that my first visit to Red Light was almost exactly two years ago; and that my initial write-up here was almost exactly one year ago. 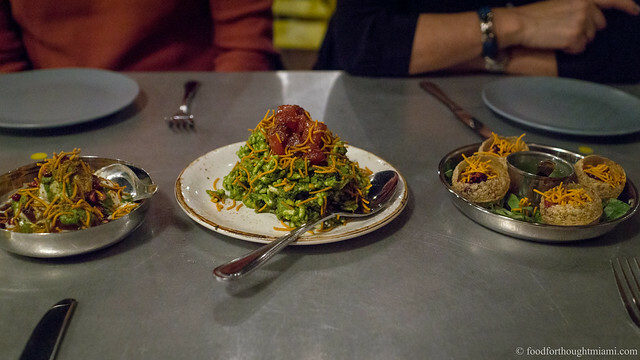 Since then, Red Light has not lacked for attention, especially of late: a couple months ago, Frank Bruni sang the restaurant's praises in the New York Times, and more recently, Chef Kris Wessel was selected as a semifinalist for a James Beard Award. What I so admire about Chef Wessel is that instead of just basking in the glory and resting on his laurels, he's clearly used the attention, and the traffic it's generated, as an opportunity to up his game. 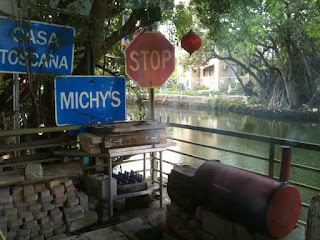 The location on the Little River still has the same ramshackle, bohemian funk to it; but the cooking - which I've always enjoyed - seems to have become stronger and steadier. When we were in this past weekend, the ingredients were better quality, the preparations more refined and precise - even some of the plates were new. 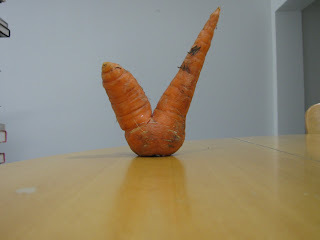 I know I swore off posting pictures of my CSA share, but - check out this carrot! There were about a dozen more of these knobby little guys in the share this week; too bad I don't have a wood-fired oven like at Michael's Genuine to roast them in. I can no longer keep track of which week is which from my CSA shares. 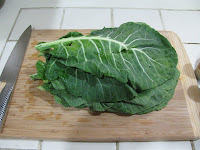 Since collard greens make a frequent appearance, this is a recipe that can hopefully come in handy. Gomen Kitfo (or Yegomen Kitfo) is an Ethiopian dish which, frankly, one of our good friends makes much better than I do, but that didn't stop me from trying it anyway. 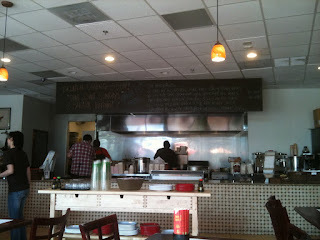 What I find so intriguing about Ethiopian food is that it is generally highly spiced, but without being "spicy" (i.e. 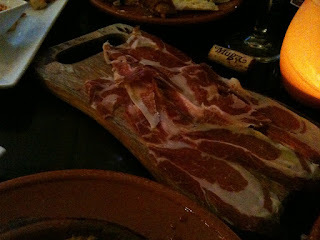 hot), using a palette of spices that we don't encounter often in Western cuisines, at least not in savory dishes. This dish is a good example: it features cooked collard greens mixed with cottage cheese flavored with cardamom, ginger, cinnamon, clove, garlic and onion. First, make some ghee. Ghee is just clarified butter, which is something that always used to sort of intimidate me, until I figured out it's not exactly culinary rocket science. 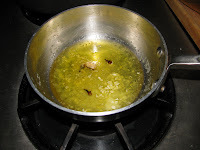 Here's how I make clarified butter: put some butter in a pan. Turn on low heat. The butter will melt. Some solids will drop to the bottom, some stuff may float to the top, everything else will be transparent and golden. That's what you want. Skim the stuff off the top, leave the stuff on the bottom. Some recipes I saw called for a flavored ghee ("niter kebbeh"), which sounded like a good idea, so I threw a bit of garlic, onion and ginger in there (just some generous pinches of each) along with a lightly crushed cardamom pod and a couple cloves. Rather than straining through cheesecloth or anything fancy like that, I just skimmed what I needed for the dish straight out of the pan. 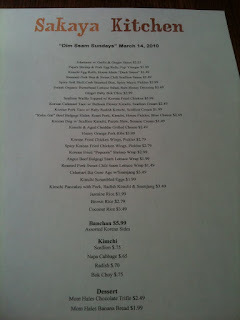 For more previews of what to expect when it opens, check here and here. What are you doing this Thursday? Why not this? 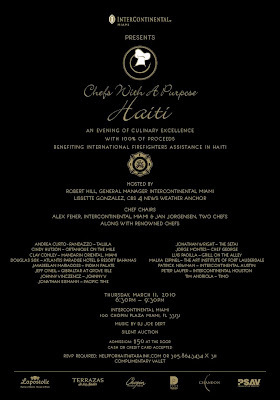 Organized by chefs Alex Feher of the Intercontinental Miami and Jan Jorgenson of Two Chefs, and benefitting International Firefighters Assistance in Haiti, this event features fifteen chefs (including folks like Andrea-Curto Randazzo of Talula, Cindy Hutson of Ortanique, Clay Conley of Azul, Johnny Vinczencz of Johnny V, Jonathan Eismann of Pacific Time, Jonathan Wright of the Setai, and Tim Andriola of Timo), for fifty bucks; and it's all for charity. Eat well and do good at the same time. If you're interested, RSVP to helpforhaiti@taraink.com or 305.864.3434 x311. I have long been intrigued by the menu at the Restaurant at the Setai - a curious amalgam of several Far Eastern cuisines - but there was always something keeping me away. Honestly, it was the prices. Intrigue will only get me so far through the door to try "small plates" that are mostly priced in the mid $20s and main courses that are generally double that or even more. 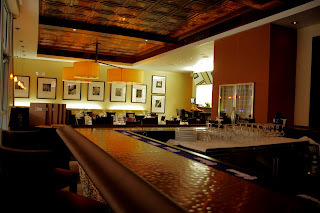 The Restaurant would participate in Miami Spice and occasionally offer other more reasonably priced programs, but I could never get my timing right. So even though the eclectic mix of Asian dishes was alluring, and Executive Chef Jonathan Wright had some solid credentials (Raymond Blanc's Le Manoir aux Quat Saisons in England, Bradley Ogden's Lark Creek Inn in California), I never made my way in. Most of these dishes come from the "small plates" section of the main menu, which also features a selection of dim sum, several different fish, shellfish and meats prepared in a variety of Asian styles, as well as noodle and rice dishes, curries and tandoor items. Though the menu credits the cuisines of India, Singapore, Thailand, China and Malaysia as its driving forces, a keen observer will note a clear Japanese influence as well. But this is perhaps better described as a "grab-bag" approach rather than a "fusion" menu - as our waiter noted, the individual dishes tend to be uniquely of one particular culinary style, rather than trying to blend them together. The restaurant itself is an unusual space, with an open exhibition kitchen and several long wooden tables jutting out at right angles from it, as well as a number of regular tables, some of which look out onto Collins Avenue. There was, however, not a lot of action going on in that exhibition kitchen, with one cook at a sauté station and another at a wok station moving in an unrushed fashion to tend to a quiet dining room. 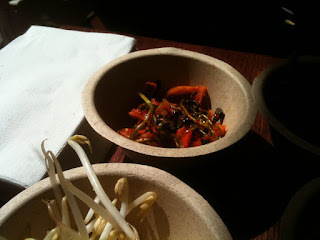 We were started with some crispy rice crackers and some pungent achar-style pickles, along with a silver bowl of toasted peanuts mixed with some small, crispy, salty dried whole fish. 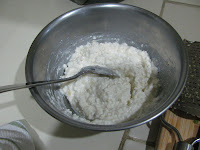 An unusual and promising start; but unfortunately, for several of the items that followed, smart and delicious sounding combinations were marred by flaws of technique or seasoning. 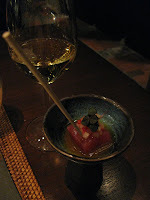 Though the "Menu Gourmand" indicates that it is served "Share Style," in fact most of the dishses were composed individual plates like this one: a cube of the lean, red flesh of a bluefin tuna ("akami"), in a puddle of shiso-inflected soy-and-citrus ponzu sauce, topped with a fine dice of Asian pear brightened with Kaffir lime, and crowned with a bit of caviar and a sprig of micro-herbs (shiso?) (apologies, by the way for the terrible quality of the photos, I'm still working on how to get decent pictures in low light). 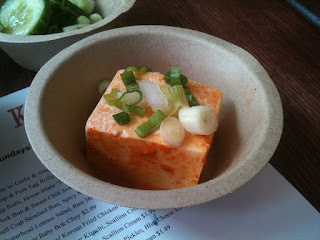 It was a nice, clean taste to start the meal, though the cube was a bit large for one bite and unwieldy to handle in any other way given the plating. 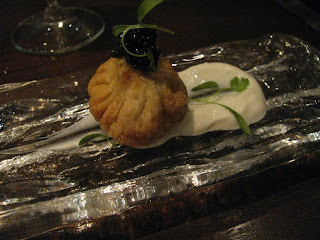 The next course offered some of my favorite things: uni, shiso, ginger, caviar. Though advertised as a "tempura," however, what came out was more of a fried dumpling, the thick casing obscuring the delicate flavor of the sea urchin. It was a shame, because I think the other components could have complemented it well, particularly the ginger-infused yogurt it was resting upon. I will confess I rarely if ever find that cooking improves uni, but if you're going to do so, it deserves more delicate treatment than this. Nobu, for instance, does an uni tempura featuring similar flavors where the uni is wrapped in shiso, then nori, then gets a very light tempura coating before being fried. Though really, even that is unnecessary. Hagashi toro is supposed to be among the most lush and fatty of tuna cuts, typically, I believe, taken from the top of the tail. 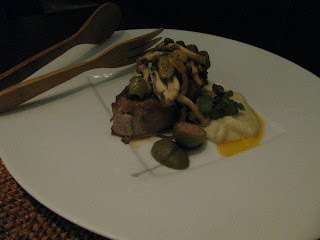 Here, a generous portion (one of the only dishes that was actually served share-style) was seared and plated with a warm salad of shimeji mushrooms, capers and olives, along with a creamy-textured garlic emulsion. Unfortunately the tuna was seared so far as to be predominantly brown rather than pink, and consequently lost most of its unctuous fattiness. As a result, my favorite elements on the plate were the mushrooms and the silky garlic pudding. 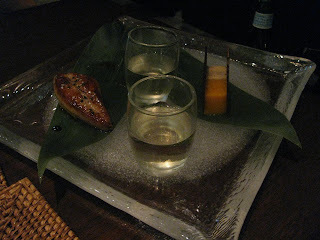 The next dish offered a combination of foie gras and mango in hot and cold forms - the hot, with seared foie over a crescent of mango fruit; the cold, a cube of foie gras torchon with a cube of soft mango sandwiched by thin crispy spice bread. The torchon was lovely, the combination with mango a tropical variant on the long-running and effective theme of playing foie against fruit. The seared foie was peculiarly bland. The traditional pairings were played out even further by serving the dish with a shot of Choya umeshu, the sweet and tart Japanese plum wine playing the role customarily played by Sauternes in this composition. 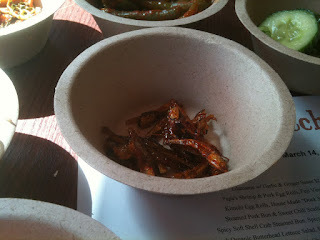 What I couldn't detect was the promised szechuan peppercorns, which might have brought a different element to the party. Calling this a "pot au feu" suggests stronger "fusion" influences than the Restaurant's mission statement lets on to. 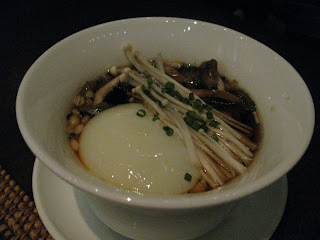 Within the bowl were a soft-poached duck egg (presumably slow-cooked in an immersion circulator), slivers of roasted duck, cubes of foie gras, enoki and shimeji mushrooms, some chewy grains (barley? farro?) 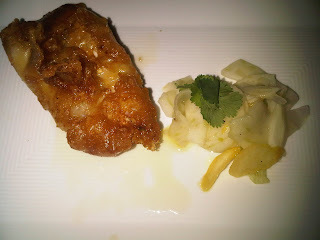 and slow-braised caramelized onions, all in a dark, sweet soy and bonito "teriyaki" broth. There were some great flavors here and I really loved the composition of elements in this dish, but unfortunately they were all overwhelmed and obscured by the overly sweet broth.